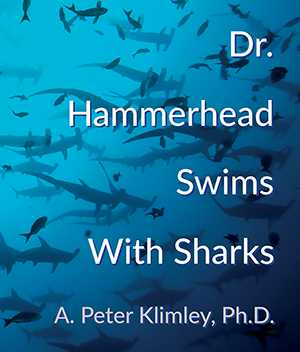 Fins Attached, a Marine Research and Conservation non-profit, is proud to publish a new book by Shark Behaviorist, Dr. Peter Klimley, titled Dr. Hammerhead Swims with Sharks. Expected to hit the shelves in April 2019, fellow marine biologists and shark lovers alike will have the chance to read the picture-laden sequel to his first popular publication, The Secret Life of Sharks: A Leading Marine Biologist Reveals the Mysteries of Shark Behavior. The book is filled with color images and first-hand experiences which takes the reader from swimming with sharks to understanding communication among sharks. The reader can expect to learn if it is safe to swim in schools of hammerhead sharks and why their schools are so incredibly large, and even answer the age-old question, is the white shark a man-eater or a seal-eater? Spoiler alert, they are not man eaters, but there is so much more to learn from the writings of Dr. Klimley.